Settlement Processing for InsuranceSM automates and centralizes the settlement of post-issue money/funding activities between carriers and distributors as well as between carriers, allowing for the optimal facilitation of insurance withdrawals, full and partial surrenders and mandatory required distributions. Settlement Processing for InsuranceSM (STL) replaces slow and costly settlement processes with a streamlined, automated tool that brings unmatched value to clients and the insurance industry. STL fully automates the movement of money in annuity withdrawals and the payment of life insurance premiums. It streamlines the settlement process between carriers and their customers’ brokerage accounts, reducing manual processes that previously involved the mailing of physical checks. Instead, with STL, funds withdrawn from annuities are issued directly back to the end-client’s brokerage account, enabling distributors to retain funds under their management. Supporting the processing of life insurance premiums, STL systematically transfers withdrawn funds from the brokerage account to the carrier. 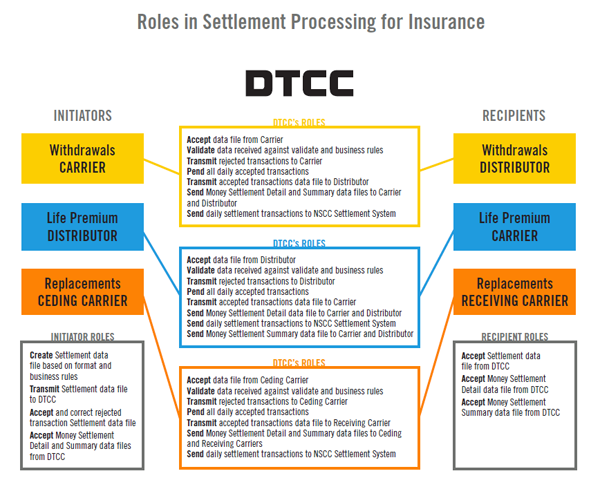 STL brings DTCC’s robust carrier-to-distributor settlement capabilities to carrier-to-carrier replacement transactions (also known as 1035 Exchanges). This unique offering in the insurance marketplace connects insurance carriers, expediting the movement of monies between ceding (delivering) and receiving carriers upon surrender of an annuity contract in a completely standardized and automated environment. Market participants that do not take advantage of STL rely on manual processing for individually transferring insurance funds between carriers and between carriers and contra-side brokerage accounts. This manual process increases the risks of misrouted money and inefficiently applied resources via administration of paper checks and reliance on mail and wire services for delivery. Settlement Processing for Insurance is available to firms that are members of DTCC’s National Securities Clearing Corporation (NSCC). Click here for information on how to become a member of NSCC. STL leverages NSCC’s one-of-a-kind Money Settlement Service to report activity—including its Money Settlement Detail (MSD) data file and the net settlement obligation Money Settlement Summary (MSS) data file—to both parties of a transaction. Settlement Processing for InsuranceSM (STL) is offered through NSCC, a DTCC subsidiary.